Black or white is the everlasting question, where the right answer doesn’t exist. These colours are classic choices you can’t go wrong with. Both will bring beauty and elegance to any room you incorporate it in. Even mixing the two can give interesting compositions. When it comes to quartz, it is for many reasons one of the most popular materials in recent years. It has excellent characteristics which make it the first choice of many homeowners and designers. 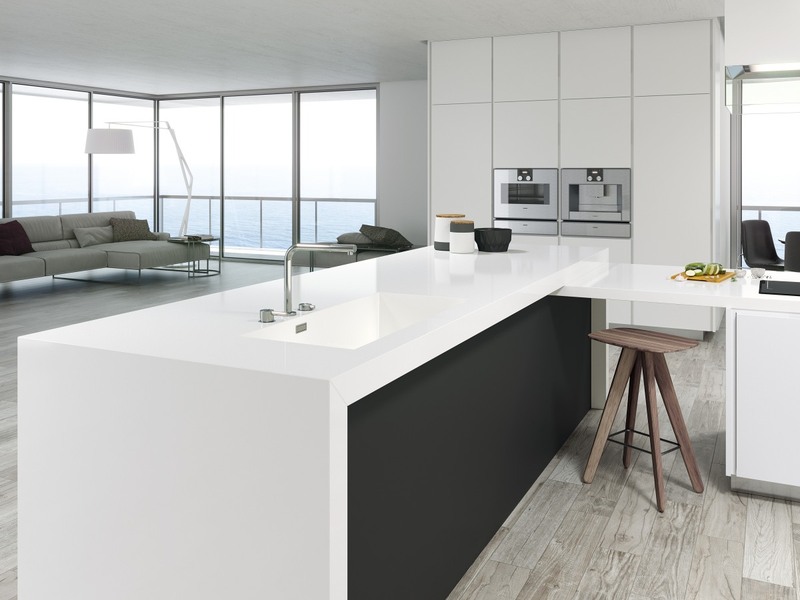 So let’s take a look at the pros and cons of white and black quartz stone. The cleaning is easily handled with just soap, water and a soft rag. You will not have to worry about sealing, because quartz doesn’t need it. Bookmatching refers to matching two or more slabs of stone so that the two connected surfaces mirror each other. Only the manufactured materials have this characteristic, and one of those materials is quartz. Along with this characteristic, quartz also has many other advantages you should know before the purchase. Bookmatching can give excellent effects on various surfaces- you can use it for the kitchen island, walls, backsplashes to give your space a unique touch that will be eye-catching. This material is known to be one of the easiest to maintain. Cleaning is easy with just soap and water and it doesn’t require sealing, unlike many other materials. Quartz is one of the most popular materials for kitchen worktops in the past several years. This material has proven to have excellent characteristics that are of value in the kitchen while at the same time gives beauty and elegance to it. Black quartz, in particular, is one of the most classic and elegant choices for kitchen countertops. Here, we are bringing you the best advantages of black quartz stone for kitchen worktops. This material is one of the hardest materials found in nature. This makes quartz very sturdy and resilient to the high impact of force. Because it is so durable, it will last you an immense amount of time. If you maintain them properly, your quartz worktops will last you for a lifetime. So, you have chosen your stone and are set on it being Quartz. 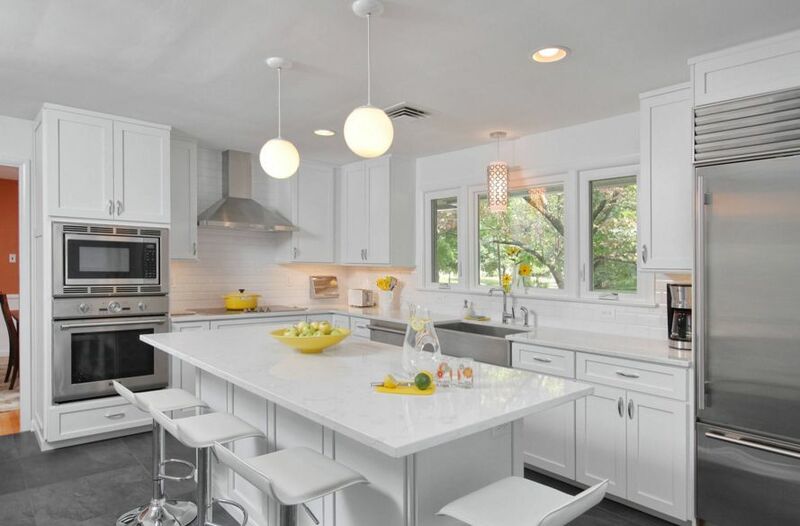 While you know that Quartz is the stone you want for your home renovation project, you may need a little help when it comes to selecting which Quartz surface to choose. Hopefully this overview will help you decide which Quartz surface and worktop is for you. Classic Quartz Stone comes in a wide range of colours and patterns to choose from, so you may be a little overwhelmed when it comes to finally deciding which to go for. You need to think about the theme that you are going for and select a colour and pattern that complements it, or a neutral colour that will go well with absolutely any other colour out there. You can be rest assured that with Quartz you are going to have one of the best ranges for colours to choose from, so it will make for a great starting point. When it comes to selecting which type of Quartz stone you are wanting, you need to consider your budget. Once you have an idea of how much you can afford, you then have a base and can immediately rule out a few options and have the ones left to choose from that you are able to purchase comfortably. There is no point in searching around for Quartz stone that may potentially be way out of your budget. However, Quartz is one of the most affordable stones out there, so you should not have any issue with getting the Quartz stone that you want. When you are deciding on the material for your surfaces and worktops, you need to keep in mind your lifestyle and which stone will work around your home, on a practical level. While all Quartz stone surfaces and worktops come with most of the same features, you will need to consider the most important aspects that you are looking for. For example, is waterproofing and UV resistance important for you? Do you only want a surface that is not sensitive to chemicals? Do you have a family home? All of this and much more needs to be highlighted in your decision making. Of course, you are going to be wanting the stone you select to reflect your individual style and the trend you want throughout your home. You are able to get Quartz stone to appear like natural stones such as Marble or if that is not your style, then you are able to choose from a huge range of other styles too. 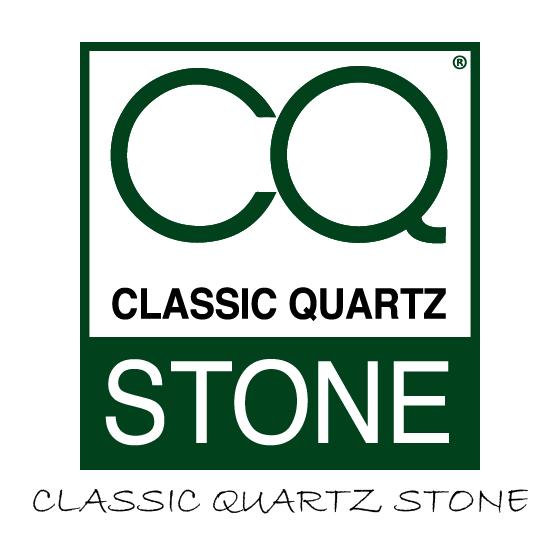 There really is a Quartz stone for absolutely everyone! Luckily, Quartz has much more choices than most other stones, so you have come to the right place. Regardless of where you are going to be placing your Quartz stone surface and worktop, you are going to want it to be incredibly hygienic; especially if it will be within the kitchen or bathroom. Quartz stone is great when it comes to cleaning and with such a low price tag, it will require minimal cleaning day to day. Quartz is a non-porous stone, therefore it will never harbour any bacteria beneath the surface, so if you spill anything that you do not have to worry about it absorbing into the surface at all. Even though on the most part all types of Quartz stone are very similar, there may be some differences that you may find important. You will therefore need to check through the pros and cons of the different Quartz stones that you like, to rule out the ones that do not appeal to you and to make sure that you are getting exactly what is right for you. Different styles of Quartz will suit different rooms, especially when it comes to the size. If you have a smaller room, then it may be useful for you to know that a lighter colour would make your room appear to be much larger than it actually is. However, it can make the room look far too big if you use it in larger rooms. Light colours give the illusion of a larger room because it bounces light around the room, creating the image of a much bigger room. When you are looking through your options of Quartz stone, make sure that you either get sent samples or are able to view some within stores. Would you like a solid, plain colour or something with more of a pattern? If you are not sure, then you would be able to try out a few different looks from glitter, speckles, veins, spots to plain. The list is limitless! Depending on the look you are going for, Quartz being a uniformed material can either be a good or bad thing. So, when you do get samples of Quartz, then you need to keep in mind that what you see is literally what you will be getting. Imagine that small sample on a big scale, and that is what your Quartz surface will look like. With Quartz, you have a few different options to choose from with finishes. Whether you want a natural finish, matte or gloss, you will be able to choose what you prefer and would look best around your home. Porcelain is quickly growing in popularity, especially when it comes to the bathroom. The reason why? Because porcelain slabs come with many pros, and not too many cons at all. To help with your search for the perfect material, hopefully this article can outline some of the reasons why porcelain should be on your list to consider. At ClassicQuartzStone we will give you a lot of the information you need to make an informed decision as to whether porcelain is for you and your home. One of the best things about porcelain is that it is available in a huge range of colours, patterns and even finishes. In porcelain, the varied pigmentation of the raw materials is what creates its range of colours that gives you the entire rainbow to choose from. The pigmentation gives porcelain its appearance of a natural stone, by featuring veining such as marble. If you are looking to place your new porcelain around your bathroom where the sun will directly hit, then you do not ever have to worry as porcelain is completely UV resistant. This means that the porcelain will never fade in the sun, leaving your bathroom looking as new as the day you bought it. Whether your porcelain is in direct sunlight or not, this will have no impact onto the colouring over time. Unlike many other materials out there on the market, porcelain comes available in a range of sizes. You are able to purchase in large slab sizes, as well as smaller. This will give the homeowner the opportunity to be flexible with the home renovation projects. The range in sizes will also remove the need for fusing multiple slabs together, giving a much more seamless look. Around the bathroom you will likely be using a range of chemicals from cleaning to beauty and there will no doubt be a few spillages from time to time. Porcelain is perfect for areas in the home where you are likely to be having harsh chemicals or even food items that can stain surfaces. By purchasing porcelain, you will have complete peace of mind knowing that most chemicals will not affect the porcelain at all. As well as being stain resistant, porcelain is scratch resistant which is perfect for any areas around the home where there is likely to be sharp objects such as razors. Having a surface that is scratch resistant is vital, especially if you have a family home with little ones running around. Even if you will not necessarily have sharp objects, its important for harder objects falling too. Porcelain is such a perfect stone when it comes to being installed, which makes life so much easier for both the buyer and manufacturer. Porcelain is great when it comes to being handled and fitted which makes it such a quick process. Your porcelain will be able to be cut so easily within the factory, resulting in the delivery and installation process to be completed efficiently. Unfortunately, as with everything, porcelain is not without its downfalls. However, it does not come with many at all which is why it is such a popular stone at the moment and is rising in popularity. Despite porcelain being scratch resistant, it is not invincible. Porcelain is able to be chipped or cracked, depending on how hard it is hit so you cannot completely relax when things get dropped. However, you can relax a little as it will take a lot of force and weight to damage porcelain when compared to natural stones. Porcelain has quickly become a very popular product for use within bathroom and kitchen renovations over recent years. It comes with a long list of pros and very little disadvantages, which is why it is a smart choice for most homes. Porcelain is extremely durable and tough against bumps and scraps, which is what makes it stand out from the crowd. Porcelain is so easy to cut into shape, which is also why manufacturers love it. But it also comes scratch and stain resistant, waterproof and is so hygienic. Not only that but as it is UV resistant too it means that the colour and pattern of your porcelain countertops will never fade in the sun. On top of all of that, it is incredibly easy to keep clean and is very low maintenance compared to a lot of other stone out there. It will never require any sealing or refinishing and what you pay for is the final product, never needing any touch ups! Going back to porcelain being hygienic – it is non-porous which means it will never hold onto any spillages which means that no bacteria can harbour beneath the surface. It is so easy to keep clean and here are some of our tips for ensuring your worktops and countertops are kept spick and span! When you purchase anything new most people tend to look into how to take proper care of it so that it will last longer within the home, especially for homes that have small children running around. You need to know how to keep it clean and that includes what you can (and cannot) use. Here is a list of detergents that are completely safe to use for your porcelain worktops. When it comes to keeping your porcelain worktop in tip top condition for years to come, you should know which products you need to keep away from. You should never use anything that is far too harsh which can damage the surface of your worktop or countertops and this includes steel wool pads. You should also keep away from using any cleaning products that contain hydrofluoric acid or its derivatives as these can also damage your porcelain worktops. For your daily cleaning routine, a damp microfibre cloth (or any soft cloth that is not abrasive) will be sufficient enough for wiping down from the day. When it comes to more regular cleaning and you want something that cleans a bit deeper, a neutral liquid detergent sprayed either directly onto the surface or onto a cloth and then wiped down with a soft sponge/cloth or a microfibre cloth. This will be enough to get rid of the bacteria from the day and keep your worktop nice and clean. For those stubborn marks that are not easily removed, you can use a bit more of an abrasive sponge – but be careful not to use one that is too rough. You can also pair it with a specially formulated stain remover. But please be careful and read the packaging to make sure that it is the right product to use for your particular surface. Even though porcelain is incredibly stain resistant, you should still wipe down any spillages from staining liquids as soon as you can. This includes coffee, tea and red wine. You should rinse with normal water and then you can clean thoroughly if you wish. Hopefully this guide has been of help and you now know how to properly take care of your brand new porcelain worktops and countertops. Quartz Stone slabs are made up of around 93% Natural Quartz and the rest is polymer resins and dyes. This means that your product is natural and has been fused with 7% polymer resin. However, people still love the Marble effect but not the huge price tag or some downfalls that come with the upkeep of the stone, which is why we offer a Quartz Marble effect range. With Quartz, you can still achieve that Marble effect look that you desire and here is why you should choose our Quartz Marble effect range for your kitchen renovations. Our Quartz slabs do not require any additional maintenance than what is generally expected when it comes to cleaning or the upkeep, unlike other natural stones like Marble. You can achieve the Marble look without the regular sealing that would need to be done. So, wave bye-bye to the long-term costs of Marble and enjoy the extra cash when you purchase from our Quartz Marble effect instead. The only price you pay is the initial purchase and fitting! Quartz Stone is almost impossible to stain or scratch, so you can be rest assured that you are protected when it comes to ruining or damaging the appearance of your gorgeous Quartz worktops. When it comes to other natural stones, scratches and damage can occur generally quite a lot easier, especially when it comes to spilling any acidic materials that can happen within food preparation areas. Quartz Stone is one of the cheapest materials to purchase for your kitchen and home renovations. Not only is it less expensive per square foot but the overall long-term costs are literally zero. You will never have to pay out a single penny more than what you do at the time of purchasing and fitting your new worktop. When you purchase Quartz Marble effect slabs, you will be surprised at how well it can withstand against heat. This makes it absolutely perfect for kitchen worktops as it can withstand against hot pots and pans much better than a lot of other materials on the market. So, you will never have to worry about damaging your work surface with hot pots again. However, we must still advise that you continue using the precautions as you would normally to prevent and lower any risk of damage at all. Not only can you use Quartz Marble effect slabs for your kitchen refit, but you can also use it in a huge number of ways. Whether you want to use it for your flooring, kitchen worktops, tables, cupboards or much more, you will never feel restricted with what you can use it for.Whatever your vision for your home renovations, you can make it happen with our Quartz Marble effect slabs. One of the huge bonuses for Quartz slabs is that the appearance is incredibly uniformed. Before you purchase and order anything for your renovations you will naturally want to look at samples first. However, with other materials out there the look can be unpredictable, especially with natural stones as the appearance differs from slab to slab. This results in a very unique but different look between all of the slabs you purchase. 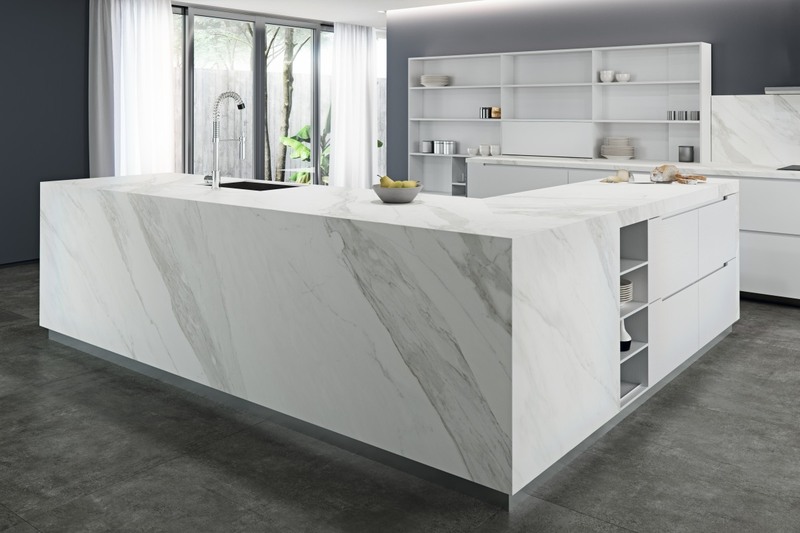 If you are looking to have a much more uniformed look to your kitchen, the Quartz can help you achieve that as it has been completely engineered and therefore predictable in its appearance for both colour and markings. Our Quartz Marble slabs not only offer beauty to your home, but it also has so much practicality to offer as well. 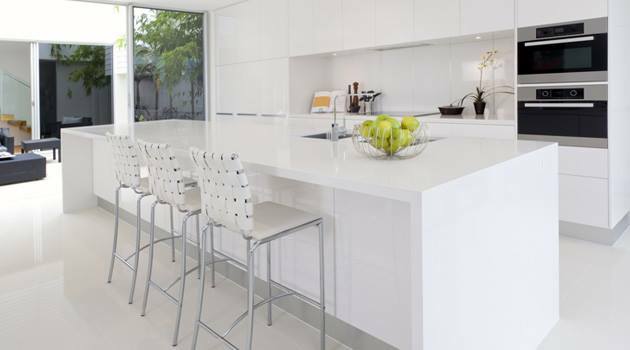 Quartz is very difficult to damage and therefore perfect for homes with a young and growing family, as you will never have to worry about scuffs or bumps along the way as the years go on. When you purchase and order Quartz Marble effect slabs, you will be receiving a stunning material and product that so closely resembles and mimics the look of Marble. So, despite it being less expensive to purchase you will definitely not be missing out when it comes to the look and style you are hoping to achieve. Whether you are looking to completely change the style of your home or keep within the same theme, go for something more traditional or modern, you will be able to find a Quartz Marble effect slab that will suit your personality. Quartz comes in a variety of colours that you will be able to find exactly what you are looking for to match the look you want for your home and kitchen. So, you are considering using our porcelain slabs for your kitchen worktops. Here is a list of 10 reasons why you should be choosing our slabs for your kitchen renovations over many other materials out there. Porcelain slabs are absolutely perfect for fitting and preparing for kitchen worktops as well as tables and cupboards. What makes it so great is that it is such as easy material to handle and cut in the factory, making it a quick process for us to give you overall satisfaction with our service and product. As it can be cut with ease, it makes it possible to use for a greater range of products around your home such as table tops, any cupboards and more. Within kitchen areas there are a lot of heavy and sharp objects such as knives and scissors being used daily, so having a surface that is not easily scratched is a huge bonus. Our porcelain slabs do just this! 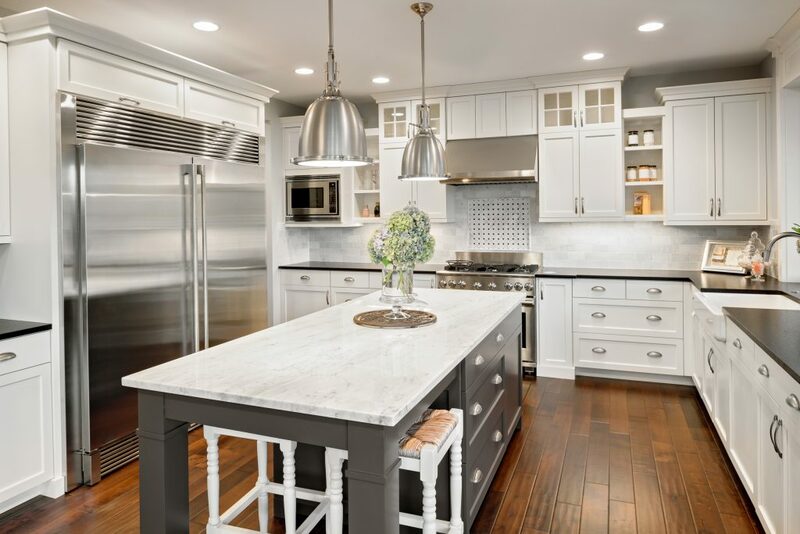 You will find it much harder to scratch our porcelain surfaces with any sharp object that you will typically find and use within your kitchen every day, so you never have to worry about any accidents occurring. With the kitchen being the area where up to 3 meals a day are prepared, there are going to be food items used that can be harsh on materials. But with our porcelain slabs you have ease of mind as they are incredibly stain resistant. Regardless of what food products you use, stains will be less likely to cling on to your worktop surface making it much easier for you to keep clean and tidy. As so many meals and drinks are prepared within the kitchen area throughout the day, there is going to be plenty of spills that occur. But what we don’t want is our customers being dissatisfied and finding that their spillages are getting soaked into their worktop and damaging the surface, so we have made sure that our porcelain slabs are completely waterproof. Any spills that occur on your worktop will simply stay on the surface until it has been wiped off with a cloth, never soaking deeper into the worktop and risking water damage. With a lot of kitchen worktops, the colour tends to fade over the years but with our porcelain worktop slabs this will never happen thanks to it being resistant to UV rays. So you never have to worry about your worktop surface that is located directly underneath your window, in the way of direct sunlight, as this will have no effect on the long-term appearance of your worktop, keeping your porcelain worktop looking great for many years to come. As our porcelain slabs are impact resistant, this means that impacts are less likely to damage your work surface. Our tough material will be sure to last longer within your kitchen with less bumps and marks than most other materials out there. However, we do still advise that you take all precaution as normal to lengthen the life of your worktop even further. Porcelain is known as being one of the most antibacterial surfaces out there thanks to it being non-porous. This means that no bacteria will harbour or live beneath the surface, instead all will remain on top so that you can clean away all germs easily. The antibacterial surface will help to keep your kitchen clean and hygienic for many years to come and will never need a treatment to keep it working in this way. Being wear resistant means that our worktops are less likely to be affected by the general wear and tear that comes with kitchen living. So you will never have to worry about general scuffs that may have occurred with other previous kitchen worktop materials. As porcelain is very lightweight this makes it perfect for fitting with easy every time, first time. There is no risk of breakages during the fitting as it will require less people than some other materials out there on the market. 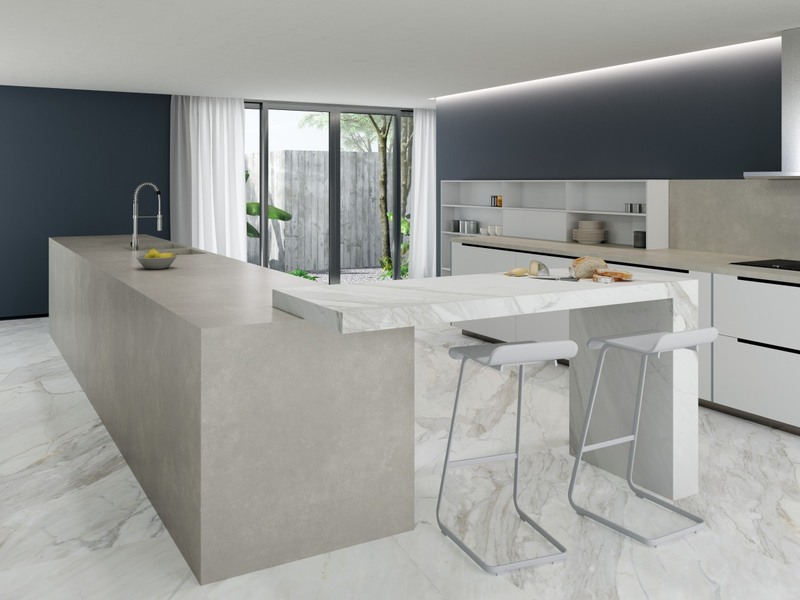 Lastly, our porcelain slabs are incredibly resistant to heat up to a certain temperature, which makes it perfect for the kitchen as the use of hot pots and pans is daily. Although, we still advise and recommend that you continue to use heat pads and other methods of protection as you normally would to prevent and lower any risk to damage and therefore lengthen the life of your worktop. As long as you take care of your new porcelain worktops, they could last you for many years to come and continue looking as fresh and clean as the day you bought them. Our stunning porcelain slabs have been made in Spain from 100% natural raw materials. Our product material has been chosen because it is incredibly easy to cut and handle, making it ideal for fitting and preparing for kitchen worktops as well as tables and cupboards around the home. 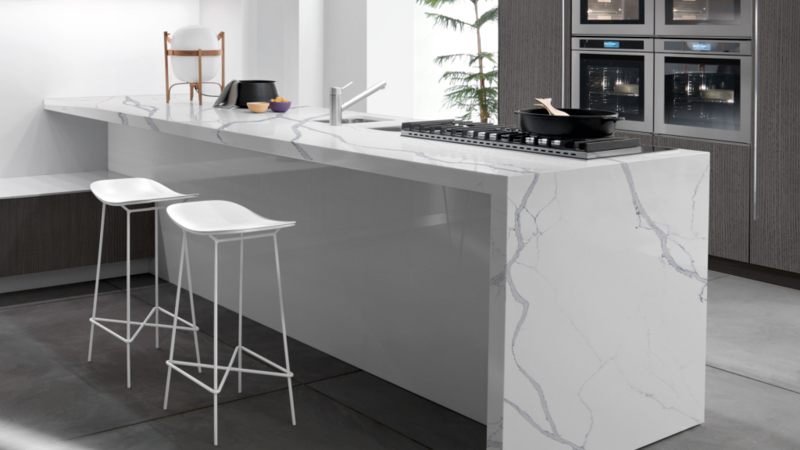 Our porcelain slabs come with scratch resistance, stain resistance as well as being waterproof for those everyday spills that occur within the kitchen and food preparation areas. The slabs are also resistant to UV rays and incredibly tough meaning impacts are less likely to damage the surface, making it last much longer. It is also great for being an antibacterial surface for preparing food. If you are considering using our porcelain slabs for your kitchen worktop material, then this guide on 5 of our gorgeous porcelain slab colours should help you within your selection process. This stunning white porcelain slab has been finished with grey marble effect markings throughout and is also available in a polished finish. This colour would make the perfect addition to both small and large kitchens alike, offering a fresh and clean look to your home. This plain white porcelain slab is also available in a matte finish for those who are not looking for that polished look. 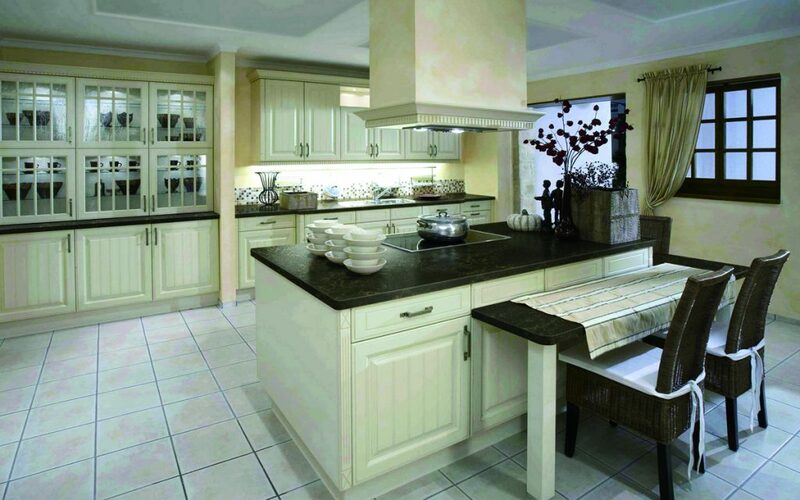 What makes this particular slab great is that it is totally adaptable for any kitchen. Regardless of your style and personality, this slab will go beautifully within your home as it will match absolutely any shade, colour or pattern that you currently have or will have in the future. Not only is it a great choice now but it is an investment piece as there will be no need to change worktop colours if you ever decide to change the colour theme. This dark grey porcelain slab colour would make an absolutely gorgeous worktop for any kitchen, small or large. Rather than being a single block grey, there are patterns of darker and lighter greys throughout the slab, making it much more interesting to the eye. Like all of our porcelain colours, this slab once again will match any of your existing ornaments, decorations and theme that you have, so there is no need to change anything you don’t want to. For those who prefer a much more simple and minimalist design, this slab colour would be perfect for your kitchen worktop surfaces. It comes in a matte finish and offers a single block black colour, which will never go out of fashion or style. If you are wanting a worktop that will never go out of trend, this is the one. This beautiful slab colour offers a similar appearance to Granite, which is extremely popular within homes across the world. If you are looking for something with a bit of a pattern, then this is your ideal slab to choose. The closer you get to this stunning slab colour, the more detail it reveals as you discover the freckles and small marks throughout the slab. You are most probably here because you have either chosen Quartz Marble for your kitchen worktop material or you are seriously considering it. Whether you have made your decision or trying to see what you could get, we have the perfect selection of colours for you within our Quartz Marble range. Our Quartz Marble range is simply beautiful and elegant. If you choose us to supply your Quartz Marble kitchen worktop then you will be getting a high quality, environmentally sensitive product. All of our kitchen worktops have been composed of 93% natural materials that include recycled glass and recycled stone. Now that you are ready to start looking at the range of colours we have to offer, we have selected five of our most popular Quartz Marble worktops to give you some ideas. This classic and luxurious Quartz Marble worktop would be suitable for both small and large kitchens, as the main colour is white which has the light bouncing effect which has the ability of making your kitchen look bigger than it is. This white Quartz Marble worktop has a grey marble effect which would be perfect for any kitchen who has a bright and light colour theme or someone who wants a colour that will match all their accessories already. Empire is one of our darker Quartz Marble worktops that would beabsolutely perfect for any kitchen regardless of size or current colour theme. The main colour is black, which is great for matching any other colour theme that you currently have or if you wish to redecorate in the future. Black is great for anyone who likes to redecorate often or switch their colour theme and kitchen accessories as you will never have to worry about finding a colour to match or changing your worktop again – once this has been fitted there’s no reason why you should have to change it in the future. The black main colour has been paired with a golden marble effect to finish off the look which offers a feeling of luxury and elegance. This Quartz Marble kitchen worktop colour is one of our most popular choices because grey is on trend and sought after within home renovations. Grey can be matched up with a huge number of colours so you don’t have to narrow down your choices for selecting a new colour theme or new kitchen accessories. Grey can actually open more doors and give you more choices on how you can decorate your kitchen which is often the heart of the home. This grey Quartz Marble worktop has been given a black and brown marble effect to finish it off and give it that classic look. Vanilla Sky is one of our lightest colours within our Quartz Marble range, which is absolutely perfect for anyone who is looking to bring in some light to their kitchen. Vanilla Sky is a creamy colour with a brown marble effect that almost appears to be golden in shade. This particular colour is great for anyone not wanting to go white but still wants that luxurious appeal that comes along with it and the flexibility for choosing a colour theme now and in the future for any redesigns. As with most of our colours within this range, they are fantastic for anyone who likes to change their colour themes and accessories every couple of years to keep on trend, but with this particular colour you will never have to worry about changing your kitchen worktop again or trying to find a colour that will match perfectly. Verona is an off grey colour that has a hint of brown along with smaller white speckles throughout the slab. This is one of our only kitchen worktop products within the range that does not follow the classic Marble effect look, instead its pattern is made up by the speckles. Verona is perfect for anyone who is looking for a dark colour to go within their kitchen but they are not wanting to go as dark as black, this particular colour has a lot of flexibility in terms of choosing kitchen accessories which is perfect for anyone who likes to change these around quite often.